The important work of our 35,000 members has had a profound and positive impact on our quest to find cures together for all cancers. For more than 100 years, as the leading cancer research organization in the world, the AACR has championed the dedicated efforts of laboratory, translational, and clinical researchers from the laboratory to the offices of policymakers, and to the bedside, transforming the way we treat cancer. The results have benefited millions of families affected by cancer, and I’m extremely proud of our progress. From identifying new ways to prevent cancer and developing new, effective therapies, to improving the quality of life for cancer patients and giving them hope, each year we continue to advance the science that saves lives from this insidious and complex disease. I am truly grateful for the passion of our members, which I wholeheartedly share, to pursue the AACR’s mission to prevent and cure cancer. We all know that the research that powers progress against cancer takes years of hard work and unwavering dedication. It also requires significant support from multiple sources. Over the past 23 years, the AACR has awarded nearly $300 million in grants to researchers around the world at all career levels and in all sub-disciplines of the cancer field. This support has enabled many investigators to explore promising avenues of inquiry that have the potential to dramatically increase our understanding of cancer and improve patient outcomes. 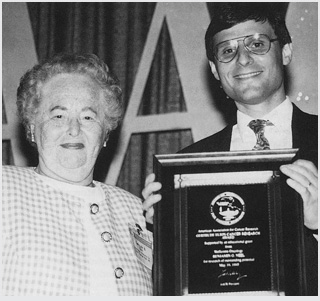 Benjamin G. Neel, MD, PhD, received the inaugural AACR Gertrude B. Elion Cancer Research Award from the 1993 AACR Annual Meeting. We are very proud to have been able to provide critical funding to not only senior researchers, but also to early-career investigators whose innovative work has contributed in a major way to progress against cancer. Hundreds of our members, including renowned scientists like Renata Pasqualini, PhD, and Benjamin G. Neel, MD, PhD, were granted AACR funding when they were young investigators, and to receive these important funds at such a pivotal juncture in their careers was an essential ingredient in keeping them in cancer research. Federal funds allocated to support cancer research and cancer-related biomedical science have declined 25 percent in inflation-adjusted dollars since 2004. This federal funding crisis has underscored the need for the AACR to raise new monies in support of investigators doing meritorious work early in their careers. Each year, the AACR receives a large number of applications for its various grant opportunities. Unfortunately, because of the enormous demand for research funding, many worthwhile proposals remain unfunded, and brilliant scientists who could contribute to lifesaving cancer research are leaving the field. We need your support to increase the number of research grants awarded to these early-career scientists and thereby secure the future of cancer science. During this holiday season, the AACR Foundation, like many other nonprofit organizations, administers its end-of-year appeal campaign. We urge you to consider a donation. Whether $25, $50, or $100, every contribution matters because 88 cents of every dollar you contribute will directly support the meritorious cancer research of a young scientist. Additionally, thanks to the generosity of an AACR supporter, we are able to provide a one-to-one match for every dollar raised through Dec. 31, 2015, doubling the impact of your donation. On behalf of the AACR, I want to thank you in advance for your contribution to help fund the future of cancer science. Your generous gift will ensure that young cancer investigators will be able to dedicate their life’s work in pursuit of our dream of preventing and curing all cancers. I wish you all a wonderful holiday season and a Happy and Healthy New Year.